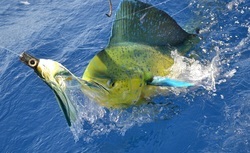 On Mauritius Island, big game fishing certainly is a must for tourists. It's for beginners to professional fisherman, a totally exhilarating experience to battle and bring a gigantic blue marlin, shark, tuna, dorado or wahoo on board. One of the best known operators on the island for catches (see the tourist guides), is irrefutably Popeye ile Maurice based on the west coast in Black River. Let Jean-Pierre (fluent in french and english) and his team take you on an unforgettable journey on the pristine waters of the indian ocean. Contact us and let us help create another amazing memory as part of your Mauritian holiday.